Over the years I have seen around five different productions of Così fan tutte, and however beautiful the music, I always come away feeling unsettled by what is a morally repugnant libretto; and perhaps the fact that the music is so wonderful seems to make the experience all the more distasteful. Thankfully Così fan tutte continued to be performed in opera houses throughout the world, though less so in the 19th century. It was not until 1934, with a production by Glyndebourne Opera, that the work was revived and acclaimed, and has remained as a staple for many opera companies since. Yet the conflict between the music and the drama remains. The question of how a genius such as Mozart could write some of the most glorious and moving music to such a debased piece of comedy, written by the author Lorenzo Da Ponte who had already provided the composer with two triumphant works in the shape of Le nozze di Figaro and Don Giovanni, is a question that still dogs the opera today (a Google search threw up hundreds of references). And yet there may well be a simple answer: the genius Mozart may well have found Da Ponte’s libretto appealing and worthy of the music he put to it. There is no rule that says those we think of as genii should also meet our moral standards just because they can create profound and beautiful work. Yet my unease remained as I took my seat. The curtain rose to a British seaside resort with pier entertainers and fairground workers busying themselves, while policemen and passers-by wandered across the stage, and the orchestra struck up the overture. The composer and musicologist, Donald Francis Tovey, was on the mark when he said of the overture that it was “one of the funniest things Mozart ever wrote” - funny both in its humour and in its strangeness. The opening forte chord gives way to a beautiful and delicate phrase for the oboe that is softly supported by the bassoon. Yet chords battle, in short phrases, as if to tell us not to get too relaxed, and we are introduced to a theme that will later be taken up by Don Alfonso in his aria on the nature of women (Tutti accusan le donne). The overture prefaces the opera’s themes brilliantly; there are basically three aspects: the purely beautiful aspect of love, its sorrowful aspect, and the cynical. Once the overture ends and the stage clears, we are introduced to two young sailors, Ferrando and Guglielmo, who are arguing with a pier entertainer, Don Alfonso, over the fidelity of their respective fiancés, Fiordiligi and Dorabella (sisters), who will be arriving in town the next morning. Alfonso wagers that if they cooperate with his plan he can prove that their idealisation of their lovers, of whom he asks if they are in fact ‘goddesses or women’ (Alfin,se Dee, se donne son), is false, and he mocks them for their simple-mindedness (E in donne pretendete/Di trovar fedeltà?/Quanto mi piaci mai, semplicità!). The two men agree to Alfonso’s wager, and to follow the older man’s orders. So sure are they of their respective loved ones’ fidelity that they raise the amount wagered tenfold, and boast that they will feast at Alfonso’s expense (A spese vostre or ci divertiremo). The next morning the sisters arrive and are excited about being reunited with their fiancés (Io sono felice!/Se questo mio core/Mai cangia desio,/Amore mi faccia/Vivendo penar). But later they are approached by Alfonso who tells them that Ferrando and Guglielmo have been called away to military service and are to leave immediately. The men (going along with Alfonso’s deceit) quickly come to bid farewell, leaving the women distraught and Alfonso to commiserate with them. Once the women have taken leave of the old man, he reiterates his scorn for the men who have put their faith in these women ("Nel mare solca/E nell'arena semina/E il vago vento/Spera in rete accogliere/Chi fonda sue speranze/In cor di femmina."). 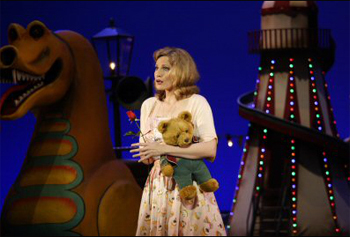 Fiordiligi and Dorabella are left to room in a guesthouse above an ice-cream parlour. In the morning they are served their breakfast by the waitress/servant Despina, who asks why they are so upset, and once she learns the reason, advises the two lovers to take advantage of the absence of their men and play the field (Razza indiscreta;/Amiam per comodo,/Per vanità./La ra la, la ra la, la ra la, la). The sisters will not hear of it and become agitated and petulant, throwing cups and plates around. It is Dorabella who displays greater hysterical outburst of the two. Later Alfonso meets with Despina and draws her into his plot. He introduces her to Ferrando and Guglielmo, who are disguised as two visitors to the town. He then bribes her into introducing the two ‘strangers’ to Fiordiligi and Dorabella as substitutes for their departed lovers. In the morning the two women come downstairs for breakfast and are shocked by the ‘strangers’ and the advances they make. Alfonso then appears and introduces the ‘strangers’ as his old friends. The men continue to make their advances and the women continue to spurn them and flee upstairs to their room. Each man feels confident of his girlfriend’s fidelity, and Ferrando sings of the power of love and the loyalty it inspires. Un'aura amoros, is one of the highlights from Cosi fan tutti as well as being one of the most beautiful arias that Mozart ever wrote for the tenor voice. It provided Andrew Tortise with the opportunity to show off a beautiful bel canto; his phrasing and pace was truly astonishing, and whist I dislike applauding of arias in the middle of an opera, it was easy to forgive on this occasion. Later, reflecting on how their lives have been changed (Ah, che tutta in un momento), Fiordiligi and Dorabella are interrupted by the ‘strangers’, who collapse at their feet. Alfonso arrives and explains that the men have taken poison because of their anguish over the women’s rejection of them. Alfonso and Despina leave together, on the pretext of finding a doctor. Alfonso returns with Despina disguised as a doctor and carrying a magnet, which she uses to ‘heal’ Ferrando and Guglielmo. Fiordiligi and Dorabella nurse the men until they are feeling well enough to continue their amorous advances towards the women who continue to resist. The first act of the Così fan tutte proved to be a brilliant execution of opera buffa. Setting the opera in a seaside town is a masterstroke that made the wager scene very funny indeed. But also the clothes gave us a sense of a new approach to the opera. Usually one would, perhaps, feel antipathy towards Alfonso from the outset, for his cynicism and Iago-like manipulation. Yet here he is dressed in the suit of a variety show comedian, and instead of a man that we would normally dismiss as evil, we are given someone of greater depth of character: he is a chancer, who sees an opportunity to make money from two, rather dim-witted, marks. By setting the opera in a seaside town, Benjamin Davis also allows a more British humour to enter into it. In one scene we see Despina’s baby being tossed around as if in a Punch & Judy show. And whilst Dorabella’s hysterical scene is given with typical buffa treatment, the dressing up of Ferrando and Guglielmo as Redcoats is very funny, even if Gary Griffiths’ Guglielmo seemed to be uncomfortable dressed in shorts. Having a bathroom above the ice-cream parlour, where Fiordiligi and Dorabella go to get away from the ‘strangers’, also proved hilarious, and is used to great effect for a number of comedic scenes. The other aspect that struck me is how the absurdity of disguise that is common in opera buffa is sent up rather well with Ferrando and Guglielmo simply given changes of clothes and false noses. Joanne Boag’s Despina is outstanding. She moves between seriousness and comedy with little effort, and the final scene, where she is dressed as an Arabian quack and is using a magnet to ‘cure’ the men, is hysterical. Máire Flavin, who was brought in to replace Cora Burgraaf in the role of Dorabella, was outstanding, and the aria Smanie implacabili was delivered with a great deal of force. 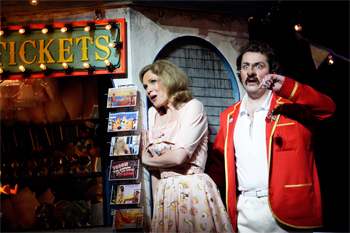 But from the outset, what really became clear was that the star of WNO’s Così fan tutte is Elizabeth Watts. Every moment that she was on stage, she dominated. Fiordiligi’s aria, Come scoglio immoto resta, was delivered with great power and tenderness. For me, it seemed that Watts was not using the aria as a vehicle for vocal pyrotechnics, as seems to be the usual case with many of the sopranos that I have seen and heard sing this aria, but uses it to provide us with an insight into the character of Fiordiligi, so when she sings “Come scoglio immoto resta/Contra i venti e la tempesta,/Così ognor quest'alma è forte/Nella fede e nell'amor”, we believe her steadfastness to be true to her love, and that it is her duty to do so. We also become aware that Fiordiligi is the moral compass around which the drama revolves. In Act Two, Despina is advising the sisters that they should enjoy life away from their men, and that women should get to know the ways of the world as soon as possible (Una donna a quindici anni/Deé saper ogni gran moda). The sisters begin to come around to Despina’s way of thinking, and they both debate which of the ‘strangers’ they will link up with (Prenderò quel brunettino,/Che più lepido mi par; Ed intanto io col biondino/Vo' un po' ridere e burlar). But what happens is that the women have chosen each other’s fiancés: Fiordiligi has chosen the disguised Ferrando, and Dorabella has chosen Guglielmo. After the ‘strangers’ have serenaded the two women (Secondate, aurette amiche), Fiordiligi leaves to go for a walk in the garden with the disguised Ferrando and Dorabella is left alone with Guglielmo. Dorabella is wearing a locket that had been given to her by Ferrando. She permits Guglielmo to remove it. Accepting the gift of his heart (Oh, cambio felice/Di cori e d'affetti! ), she allows him to seduce her. Fiordiligi, on the other hand, resists, though she begins to feel attracted towards the disguised Ferrando (Io ardo e l'ardor mio non è più effetto/D'un amor virtuoso; è smania, affanno), which leads to the highlight of the opera, Per pietà, ben mio, perdona, one of the most outstanding arias in the operatic canon, and central to our understanding of the torment that Fiordiligi experiences, between the immediate needs of male company and her loyalty to her fiancé. At this point the audiences are asked to question the very nature of love and fidelity, and to me this represents a revolutionary idea for Mozart’s (and perhaps our own) time: just how much do we bind ourselves to our duty at the expense of happiness? Later, Romantics would come down on the side of fidelity, but at a time of enlightened thinking, sweeping away the old authorities of feudalism, this question was more than simply an expression of a libertine, it raised the issue of freedom as a whole. It also seems to give lie to the idea that Così fan tutte is misogynist, when we bear in mind that Despina (who is unaware that the ‘strangers’ are really Ferrando and Guglielmo in disguise) is playing the same game as Alfonso. When the two men meet to compare their experiences, Guglielmo is delighted to hear that Fiordiligi remained faithful. Ferrando, who assumes that he has won the bet, is horrified to discover that Dorabella has been unfaithful (Eppur un dubbio,/Parlandoti a quattr'occhi,/Non saria mal, se tu l'avessi), and he has to be restrained from taking revenge. When Alfonso arrives Guglielmo demands his share of the wager, but Alfonso tell him that his time is not up yet and he must still wait. There follows an extremely funny scene in the bathroom, with Despina delighted that Dorabella has given in. But Fiordiligi admits that she is torn between her loyalty to Guglielmo and her feelings towards the disguised Ferrando. Despina tries to get her to take a chance, but Fiordiligi decides to try once more to ignore temptation and demands that Despina fetch their lovers’ uniforms (Tieni un po' questa chiave e senza replica), saying that she and Dorabella should disguise themselves as soldiers and die on the battlefield with their lovers. As she is trying on the uniform Ferrando enters and attempts to seduce her, saying that he would die if she left, and taking the sword that is part of the uniform, asks her to strike him with it, as he could not go on if she were to leave (Ah no, mia vita!/Con quel ferro di tua mano/Questo cor tu ferirai). Eventually she succumbs, and Ferrando succeeds in seducing her. Now it is the turn of Guglielmo (who is listening in on it all, along with Alfonso) to despair, leading to Alfonso’s great aria, Tutti accusan le donne, and for him to smugly declare “Così fan tutte!”: “That’s how women are!”. Despina arrives to announce that the ladies have agreed to marry the ‘strangers’ immediately (Vittoria, padroncini!) and have sent her to find a notary to perform the ceremony. Alfonso and she go off while the townspeople organise a banquet (Facciam presto, o cari amici). Alfonso returns with Despina disguised as a notary and the ceremony commences rather hurriedly (Cose note, cose note!Vi crediamo). Then, off-stage, we hear a chorus (Bella vita militar! ), and Alfonso, rather dramatically, announces that the former lovers are returning and the two men are forced into hiding. Dressed in military uniform, Ferrando and Guglielmo make their entrance and feign confusion over the restrained reception they receive. Guglielmo notices the notary and picks up the marriage contract with the women’s signatures (Un contratto nuziale!). The women point to Alfonso, who, they say, has deceived them, at which point Alfonso lets them in on the deception, to which the women pledge their fidelity as atonement (Compensar saprò il tuo core,/Adorarti ognor saprò), and the opera ends with each declaring that life is not so straightforward, and that what pleases one may destroy another (Quel che suole altrui far piangere/Fia per lui cagion di ris). Since its creation, that Così fan tutte has been described as opera buffa, was according to the composer’s original plan for the opera. Yet whilst there is comedy within it, Così fan tutte does not follow the template of the buffa: there is no happy ending and no real reconciliation. The lovers are left with their illusions in tatters. One fact about Così fan tutte that is worth rememberingis that in the final draft, Mozart changed the description of the opera from buffa to Dramma giocoso, and in this production, one can readily see why Così fan tutte cannot really be seen as a comedy. The first act is certainly driven by the comedy, especially of the dim-witted male lovers. But in the second act, they have become willing participants in the deceit, and seem to relish the belittling of their fiancés. Fiordiligi’s doubts and her feeling of guilt are made very real within Benjamin Davis’ vision for this opera, and it is not the character of Alfonso alone who comes across as a vile person, so too do Ferrando and Guglielmo. Little in the second act could be described as comical - there are far too many emotions that run through it, both dramatically and musically, and by the end of it, I realised that my views about this opera had changed. Far from being misogynist and cynical, Così fan tutte is, perhaps, Mozart’s most humane opera. Art should always challenge our perspective on life. The dramatic arts are the most effective in doing this because we are watching human beings interacting with each other on stage or screen, and this gives us a more immediate picture of what is going on. But opera goes one step further, because not only are there actors on stage but there is an orchestra in the pit and unlike, say, the Musical, the music is not an accompaniment to the drama - it is an essential part of it. And that seems to me the reason why there is much confusion surrounding Così fan tutte, and why many critics could not understand how Mozart could compose such beautiful music for a libretto that is particularly distasteful. But opera is littered with these apparent contradictions. Opera buffa is noted for its cruel humour especially against old men (though this is widely accepted as a challenge against an authority figure, as is the case with Le nozze di Figaro). But if we consider Puccini’s Turandot, there is a great deal of cynicism running through that. The narcissism of its hero, Calaf, is captured perfectly in the aria, Nessum dorma -and few would deny the beauty of the music. Yet in pursuit of Turandot, Calaf is quite happy to see Lui (his slave for whom, we are given to understand, he has feelings) executed ,and the aria Nessum dorma condemns a whole city simply so one man might satisfy his sexual urges. WNO’s latest production of Così fan tutte is the most intelligent I have encountered. It is not simply the setting that inspires, it is the fact that it gives this opera an edge of realism. For me, it seems as if Mozart (who must have had a hand in writing the libretto) intended to go against the mainstream of doomed lovers and fidelity (whether to each other or a higher authority) and present us with the world as it really is: messy and confusing. Alfonso seems less than the Iago figure and simply the mechanism that drives all the confusion. At the end of the opera we are not left with a happy or sad ending. There is no ‘closure’. We are left with just an ending.